Kelli and I were up early as our brother-in-law Scott was to drive us to Newark Airport a little after 4 in the morning. It was a cool morning at 45 degrees, we were looking forward to much warmer weather. With it being Easter Sunday morning there was no traffic and we made it easily to the airport a little after 5. We checked our bag at curbside, got our boarding passes and got into a moderately long security line. Lots of other people had planned to travel that day as well. Our friend Mark was behind us in line so we waited for him to get through. We were at the gate in plenty of time where Saul & Judi, and Fran were waiting. Ruth joined us shortly thereafter. 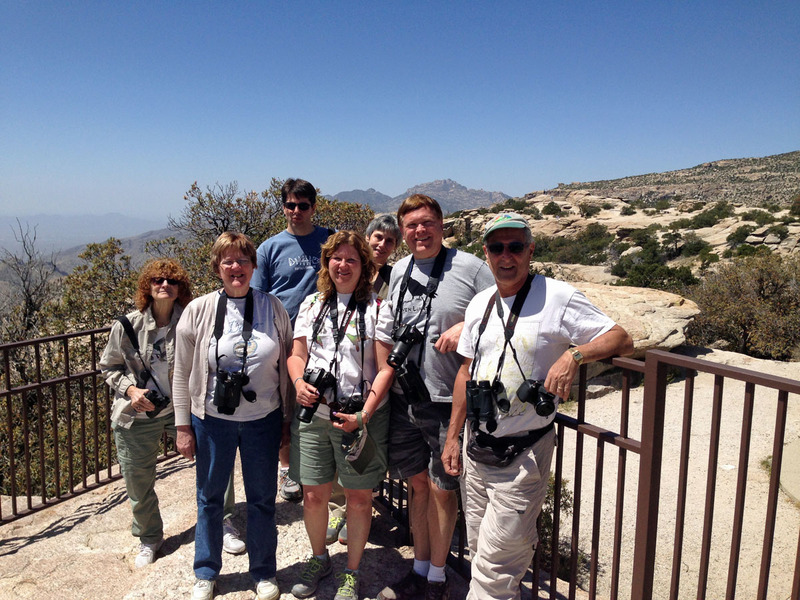 All seven of us were looking forward to cool desert fauna to canyons filled birds. We had a long layover in Atlanta in route to Tucson and enjoyed a nice meal at Cafe Intermezzo. Our flights were uneventful and after getting the car rentals headed a few blocks to search for a reported Burrowing Owl site but we were unable to locate it. Consolation prize was a Greater Roadrunner in a tree and eventually running on the ground. 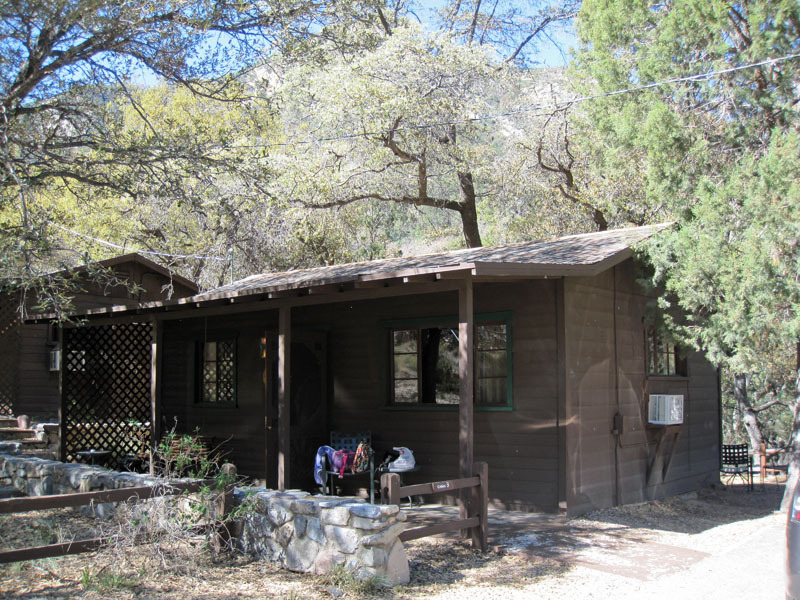 We made our way to Green Valley, stocked up on provisions at a Safeway in town and headed up White House Canyon and Madera Canyon roads to the Santa Rita Lodge in Madera Canyon http://www.santaritalodge.com/. The lodge has accommodations that include efficiency cabins with kitchenettes. 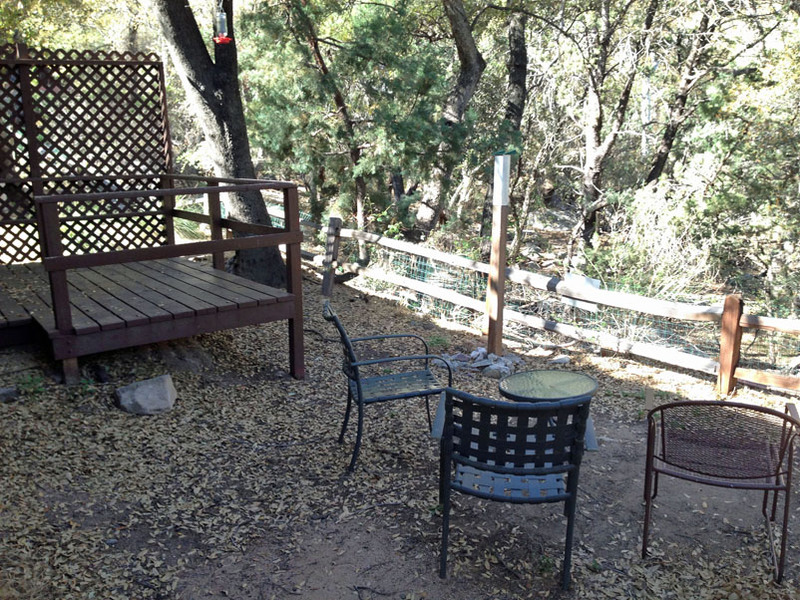 We had cabin #3 with a back deck overlooking a wooded area. It had its own hummingbird feeder. After everyone settled in we all met at the lodge’s feeding/viewing area. They have a great set up here. There are plenty of chairs and two sun shade areas to sit under. 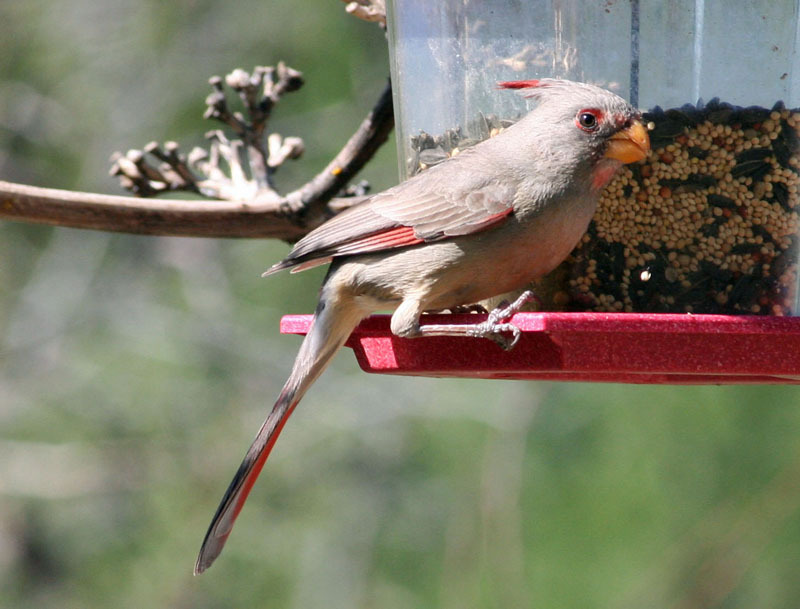 You look at or down at the feeders for great viewing and photographic opportunities. We immediately saw Mexican Jays, Acorn Woodpeckers and Broad-billed and Black-chinned Hummingbirds. Other birds seen were a Red-naped Sapsucker, a lifer for Michael and a Bridled Titmouse, a favorite of Kelli's. 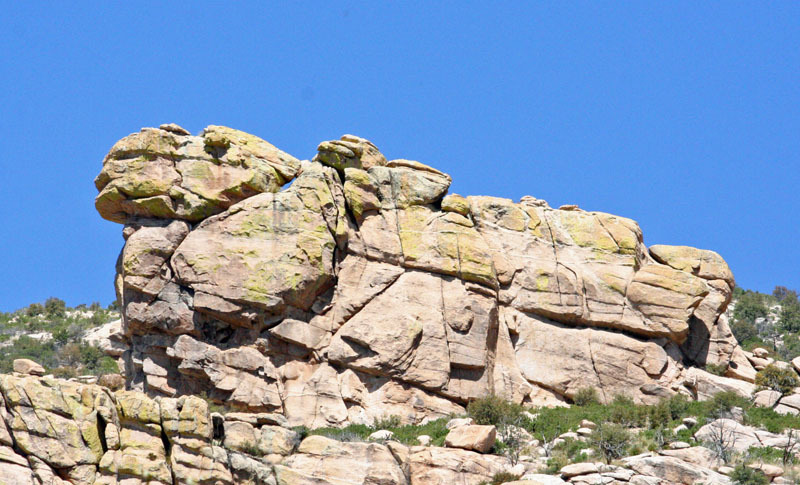 An advantage of birding Arizona in early April is that high elevation species can be seen lower. 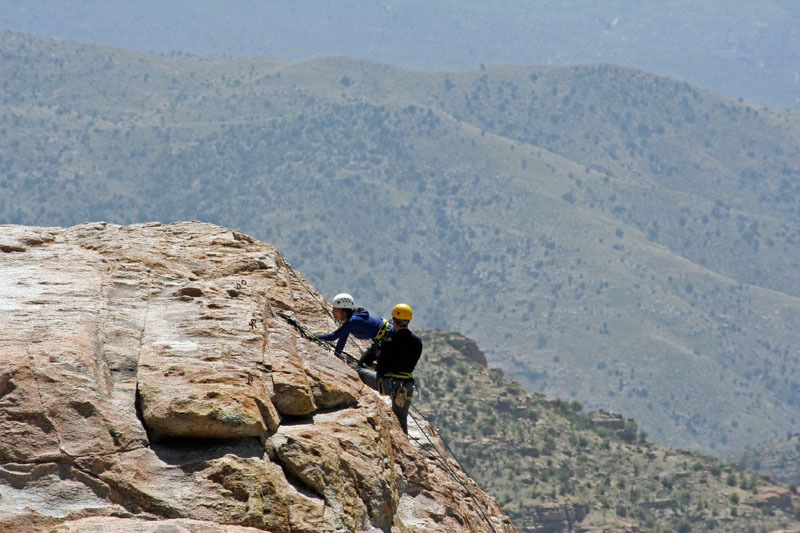 They do not require an arduous climb on a steep canyon trail. We all got to see Painted Redstart and Band-tailed Pigeon from our comfy feeder chairs. Pine Siskins were numerous, filling up a large thistle feeder with a few Lesser Goldfinch mixed in with them. We each had dinner back at our cabins, Kelli and I invited Mark over to our “backyard” to eat. 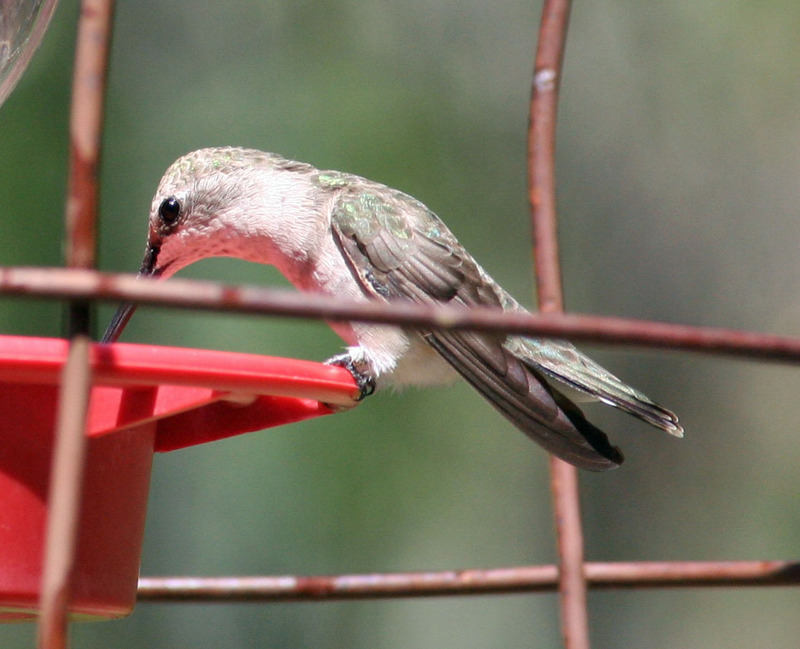 We were able to see some birds including more Broad-billed Hummingbirds along with a much larger magnificent Hummingbird coming to our cabin feeder. I got a glimpse of a Hutton’s Vireo and we had a Townsends Warbler up high in a tree. We heard from other birders that the Amphitheater, just up from the lodge had an active Elf Owl nest hole. Even though we were tired from a long travel day all seven of us stood in the parking lot staring at a hole in a tree as night fell. No owl was seen so we dragged our weary bodies back to our cabins for a great night sleep in the fresh Arizona canyon air. We were up early and had a simple breakfast and all met at the lodge’s feeders at 6 AM. It was cool with the day starting out in the low 50’s. Once all assembled we drove down to the Proctor Road area and parked. We heard Bell’s Vireo and Verdin calling. It was difficult to get good views but we all managed to see the vireo, but only two of us had looks at the Verdin, as well as a Rufous-winged Sparrow. We saw a flycatcher and eventually identified it as a Dusky Flycatcher, another lifer for all of us. On the way back to the cars we found a Hermit Thrush and a Canyon Towhee on the ground. We then drove to the top of the Canyon and parked in the Mt. Wrightson Picnic Area. We took the trails leading further up the canyon. It was still chilly and a bit quiet. We heard a Northern (red-shafted) Flicker but only one person saw it. We added common birds such as House Wren, Brown Creeper, Ruby-crowned Kinglet and Cedar Waxwings. Everybody got to see one of the two Black-throated Gray Warblers found as well as decent looks at a Painted Redstart. The highlight was a Dusky-capped Flycatcher perched high but out in the open. We headed back to the lodge for more time at the feeders and lunch. Some of us got to see a pair of Hepatic Tanagers come to the feeders. 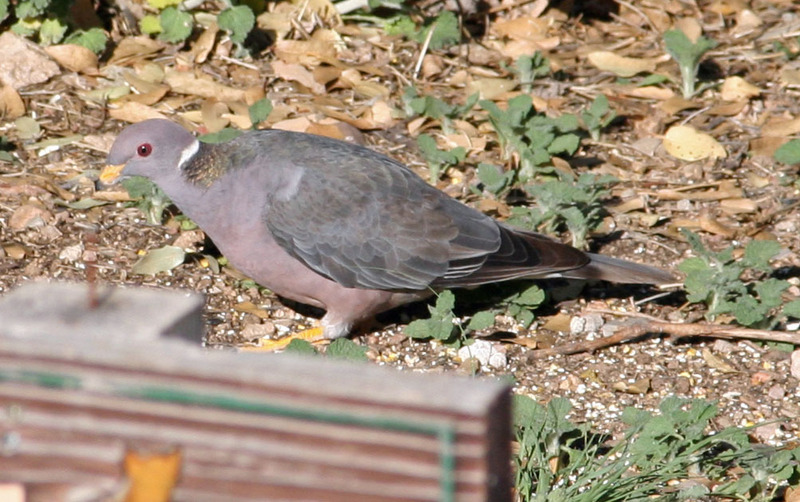 Other additions at the feeders included Gray-headed Junco, Arizona Woodpecker, and White-winged Dove. We met the owner of the lodge and he informed us that the lodge has three pair of nesting Elf Owls and gave us great tips on how to see them later tonight. After lunch in our cabin we spent most of the afternoon enjoying the feeders. 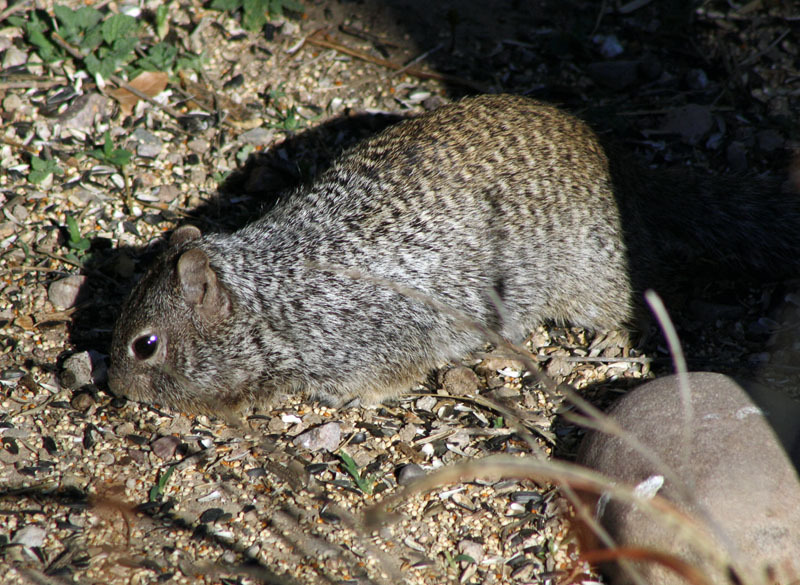 A single Rock Squirrel and a few Arizona Gray Squirrels were there. 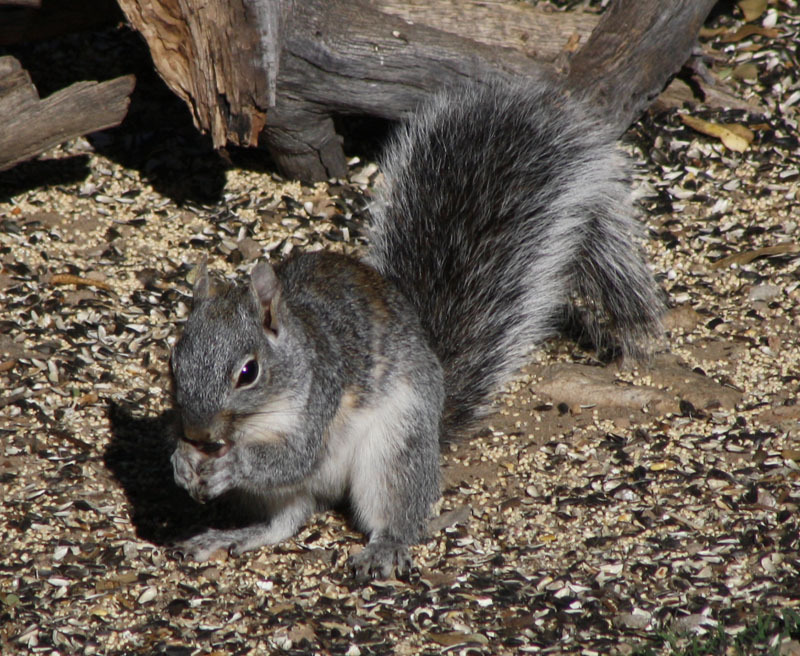 This gray squirrel looks very similar to our Eastern Gray Squirrel but they have a longer tail. A small Mexican Vole with its stubby tail was seen near the flower pots where we sat. A hawk flew high over the canyon. It had a single white-tail band of equal width with its two black bands and no terminal white band was seen. It immediately looked like and shaped like a Broad-winged Hawk to me, but that’s common at home, not here. A couple of local birders could not id it. I tried to make it into one of the expected southeast Arizona specialties such as a Black-hawk or a Gray Hawk, but neither fit this bird. I am convinced this was indeed a Broad-winged Hawk, unusual but not unexpected in this part of Arizona. Acorn Woodpeckers have a habit of storing large amounts of acorns. Acorns are placed in holes drilled into a tree, called a granary tree. One granary tree may have up to 50,000 holes in it, each of which is filled with an acorn in autumn. 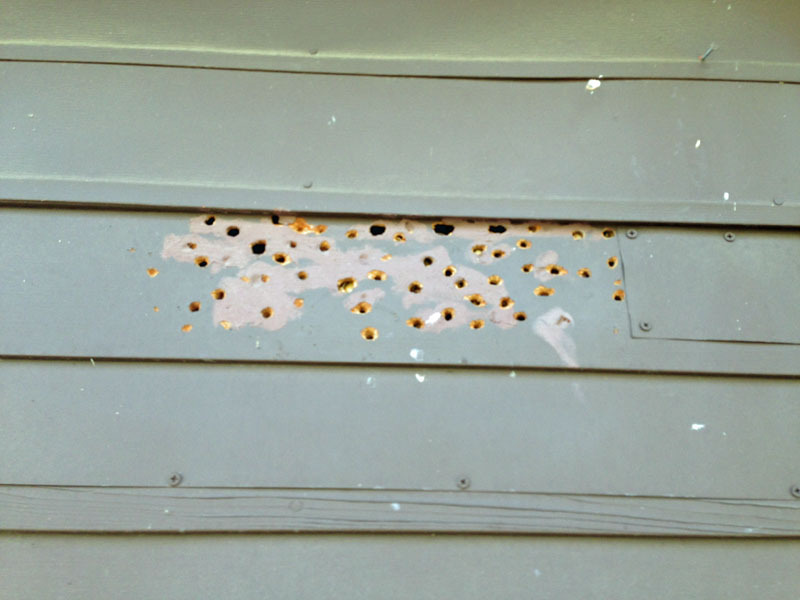 The Acorn Woodpecker will use human-made structures to store acorns, drilling holes in utility poles and even buildings, these holes were found in the back of our cabin. In the late afternoon Mark needed something from town, so we drove with him on this quick run. 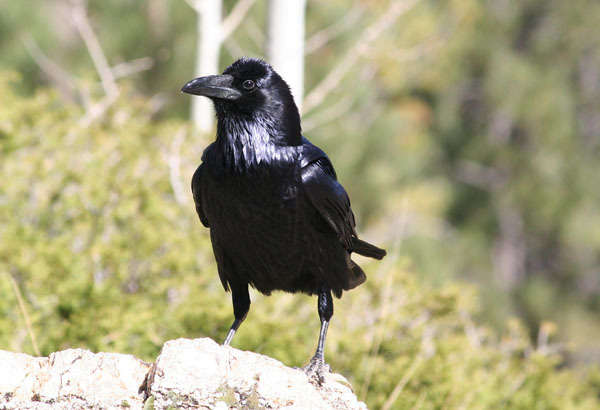 We confirmed that the ravens along White House Canyon Road were Chihuahuan Ravens. We also added a Phainopepla and Eurasian Collared-Dove while driving. Kelli, Mark and I found a Canyon Wren on the chimney of the next door cabin while eating dinner outside. 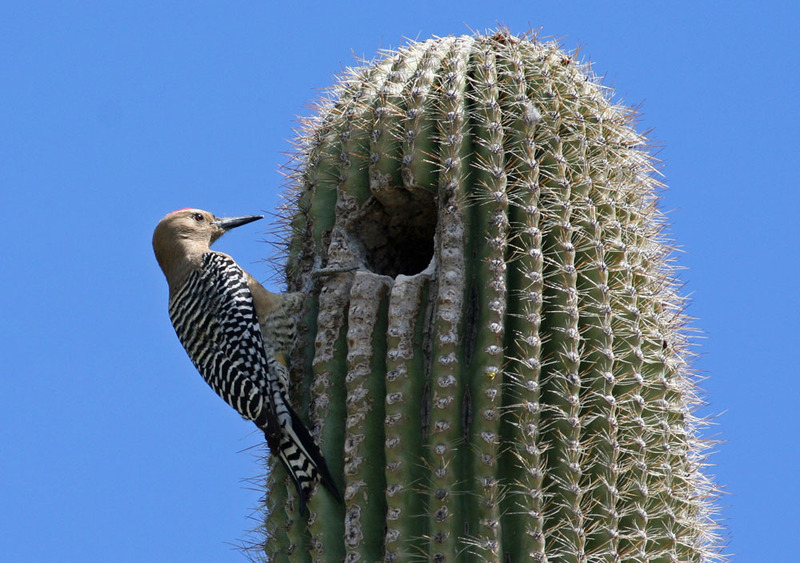 An Arizona Woodpecker appeared and worked his way around a tree and it afforded us with some good picture opportunities. Wild Turkey strutted in the woods below us then settled down. They scratched a depression in the dirt then laid down with their necks out to avoid the afternoon heat. These turkeys are one of the five subspecies found in North America. 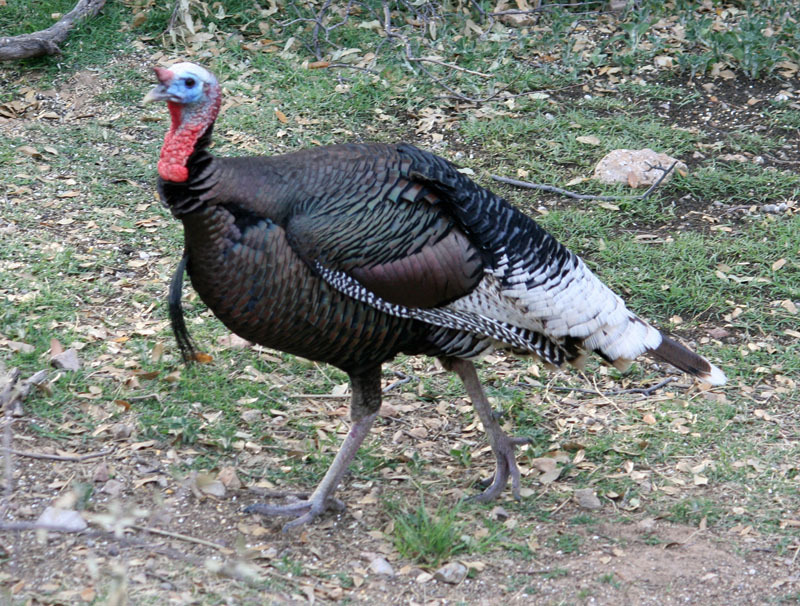 The Gould’s Turkey is the largest of subspecies. 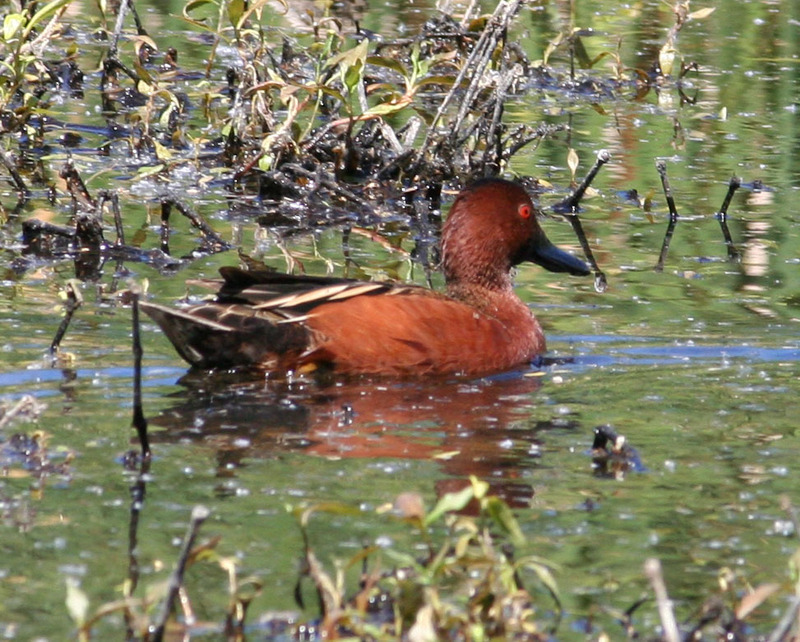 They have longer legs, larger feet, and larger center tail feathers than any of the other subspecies. Gould’s differ by having distinctive white tips on the tail feathers and tail rump coverts. We all met just before sunset near the feeder viewing area and concentrated on a telephone pole which had a number of large holes in it. A couple at a nearby cabin had a different vantage point and started to see in an Elf Owl poke his head out of one of the holes. They invited us over to get a look. It eventually left the hole. We found him in a nearby tree and got a good look. The lodge’s owner met us and invited us over to another tree where we could see another owl, much lower and easier to see. We had awesome views of this little guy, North America’s smallest owl, less than 6 inches tall. Walking back to our cabin, Kelli and I heard a Whiskered Screech-Owl calling in the distance. 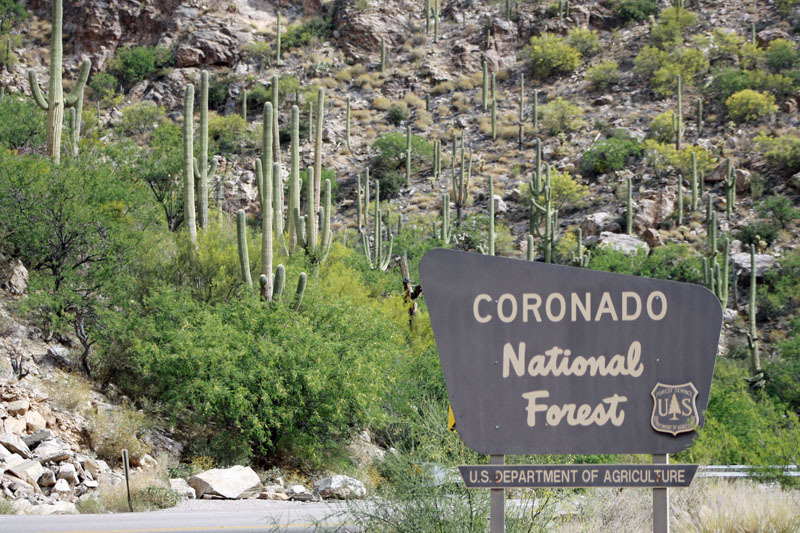 Madera Canyon and the Arizona Sonora Desert Museum. 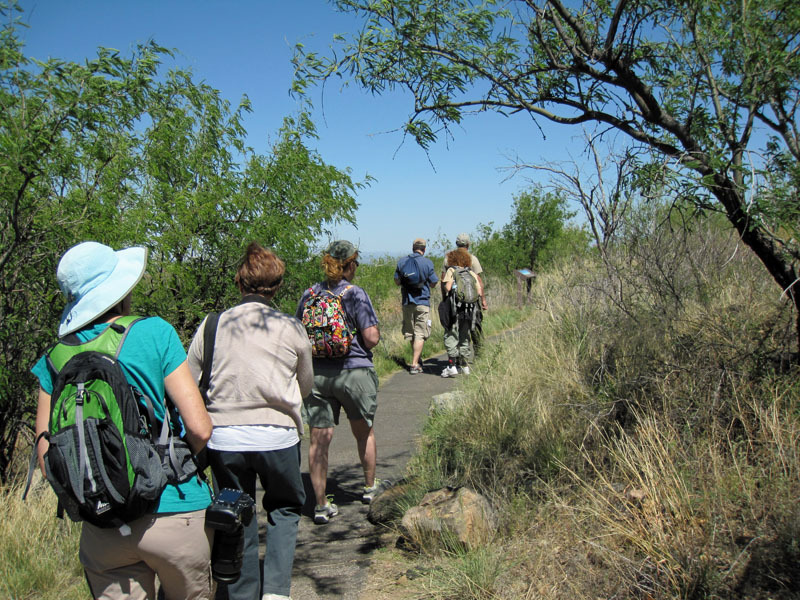 It was another early day and this time the group walked the road up to the amphitheater and took the trail along the creek down to the Madera Canyon Picnic area then back up to the lodge. On the way up we found 20-30 Turkey Vultures had roosted in the trees over the Casita cabins of the lodge. After the obligatory jokes about part of our group that stayed here we continued on. The trail had at least 3 pairs of Painted Redstarts. 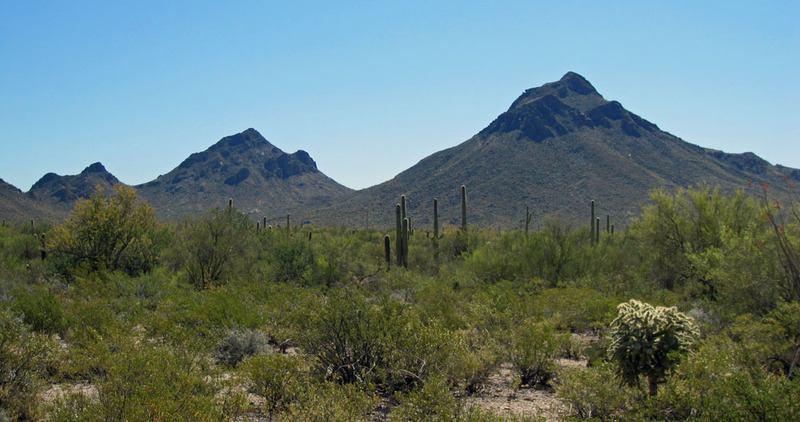 After checking out we all made our way over to the Arizona Sonora Desert Museum. 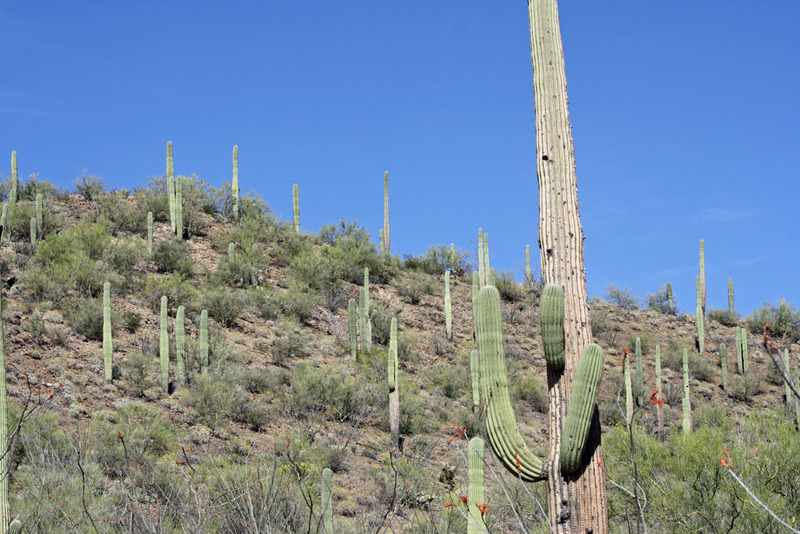 The road in went through a desert of Saguaro and other cacti. The museum is a mix of zoo and botanical gardens. Wild birds here included great looks at a Greater Roadrunner, Anna’s Hummingbird, Cactus Wren, Gila Woodpecker, Verdin, and both Black-tailed and Blue-gray Gnatcatchers. A Curve-billed Thrasher was seen in the distance. Our favorite outside exhibit were the Coatimundi. This relative of the raccoon was much larger than we thought. It was getting hot and we were tired so we decided to eat in the air-conditioned Ocotillo Café. After an excellent lunch we headed out of the park. I had a brief view of a Costa’s Hummingbird. Kelli and I lingered and found a Brewer’s Sparrow perched on a cactus. 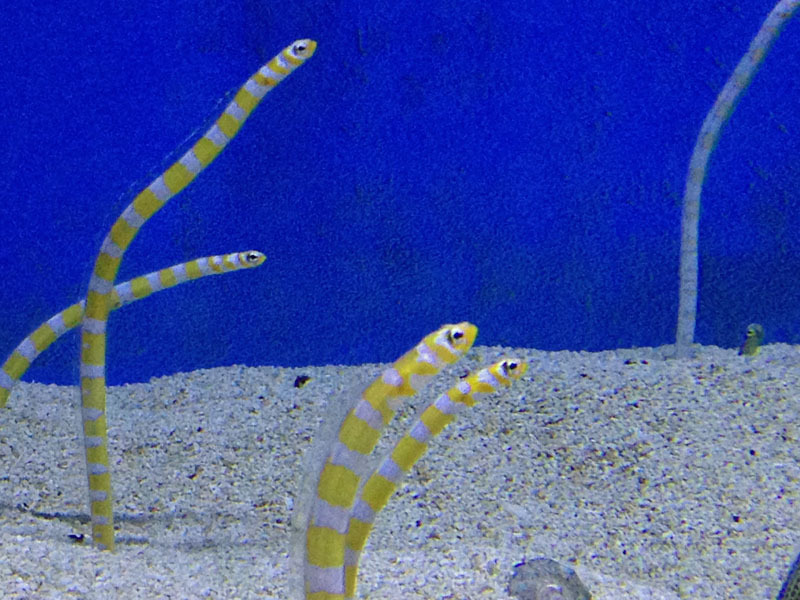 We checked out the aquariums near the entrance and were fascinated by the Garden Eels. On the road out we came across a Swainson’s Hawk perched on a telephone pole. We checked in at Best Western Green Valley Inn and headed for the pool. It was windy and the pool was cool. I hit the hot tub as well. Dinner was at the 19th Hole and Bar, the restaurant in the hotel. The food was very good and it was great having a restaurant in the hotel. It makes for a much more relaxing evening, especially being able to enjoy a few round of drinks and wine. We got up early, got ready then had the free breakfast offered by the hotel in the same restaurant as last night. We all left for the Patagonia area shortly after. Along South River Road we came across a Gray Hawk on a telephone pole and we all had great looks. A Swainson’s was seen along the Patagonia Highway near the airport. 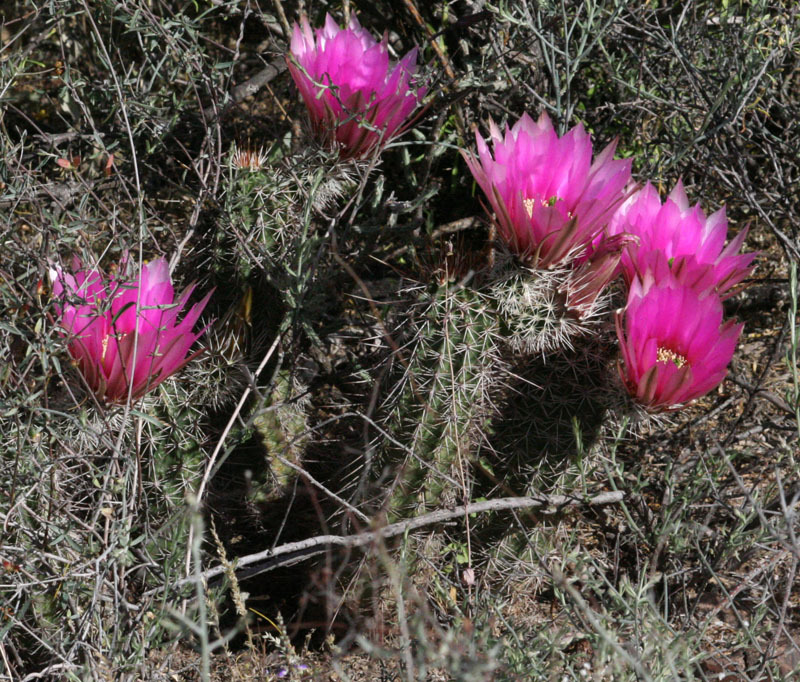 Our first stop was Patagonia Lake State Park. After a needed restroom break we headed down to the lake. American Coots and Great-tailed Grackles were immediately noticed. The lake also had Pied-billed Grebe, an Eared Grebe, and our first Neotropical Cormorants. A large dark bird a prey with broad wings appeared on the hills across the lake. It made its way back and forth then headed across the lake towards us. It was dark with a yellow bill and legs, its short tail had a white band – a Common Black Hawk! It flew right over us then east along the lake. Another great lifer for Michael! We drove east to the nature trail. A feeder along the way had Cardinals, House Finch, a couple of the orange variety, a White-crowned Sparrow and Broad-billed Hummingbirds were near-by. Down by the marshy lake we had a number of pairs of Vermillion Flycatchers. Cinnamon and Blue-winged Teal fed in the shallows and Yellow Warblers and Common Yellowthroats sang. 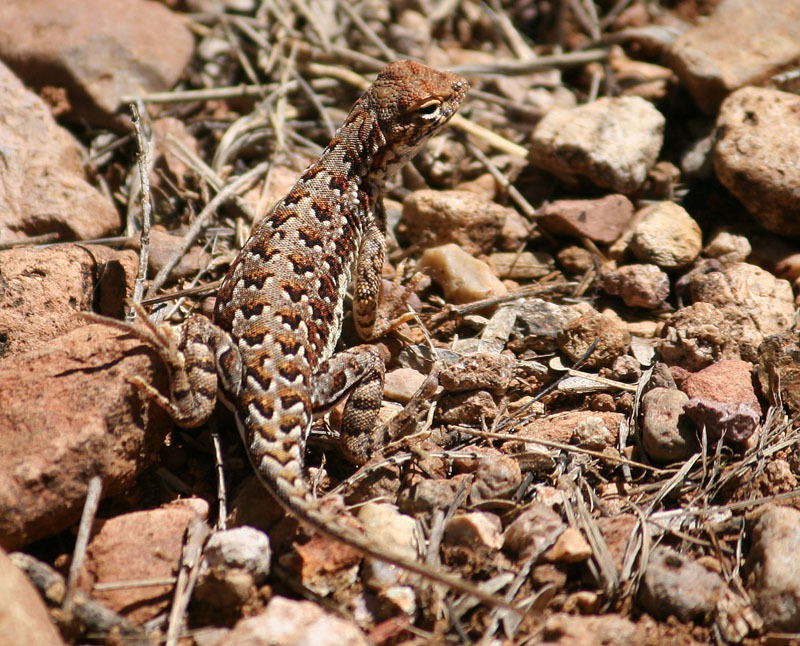 On our trek back we came across this cool looking lizard. Back near the entrance, near the bathroom a Say’s Phoebe perched for some pictures. Our next stop was Paton's back yard in the little town of Patagonia. Wally and Marion Paton and their yard became famous in the 1970’s when a Violet-crowned Hummingbird came to their feeders. Before long birders from across the country started to visit to get a glimpse of the bird. 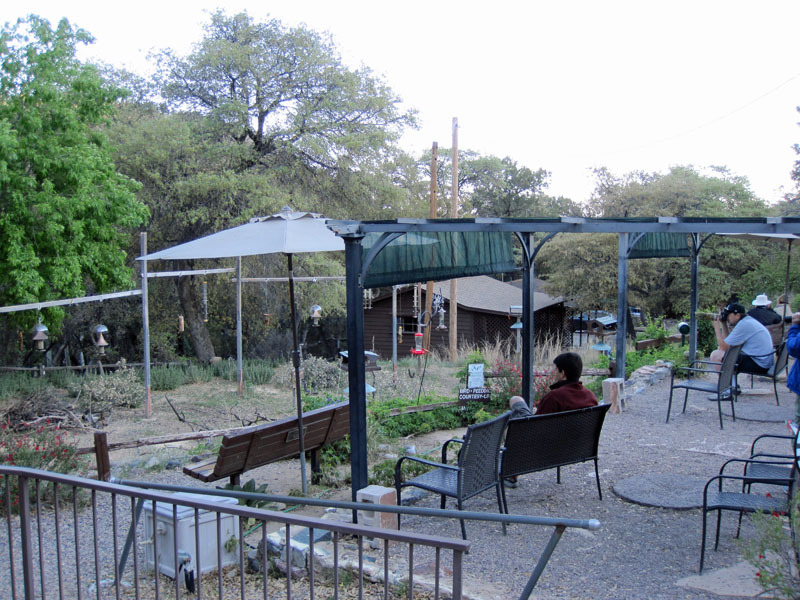 The Paton’s not only welcomed birders, they set up shaded seats and benches and added more feeders. They did this for years. Wally passed away but his widow continued filling the feeders into her late 80’s till she passed away in 2009. 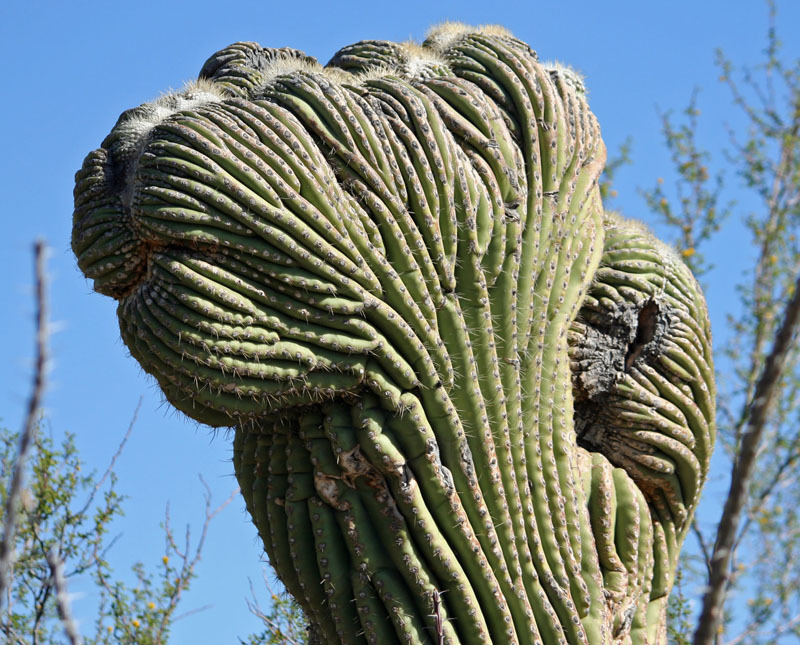 The family continued the tradition till the property was turned over to the Tucson Audubon Society in 2014. 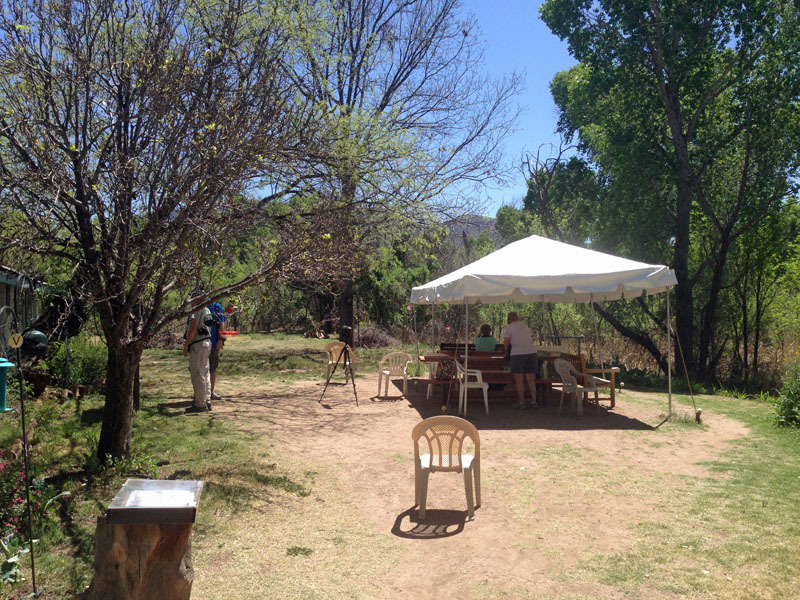 In early 2015 it became the Tucson Audubon's Paton Center for Hummingbirds. It took a while before things got very active, a little patience paid off. One of the first good birds was a Green-tailed Towhee, followed by an appearance of an Abert’s Towhee. 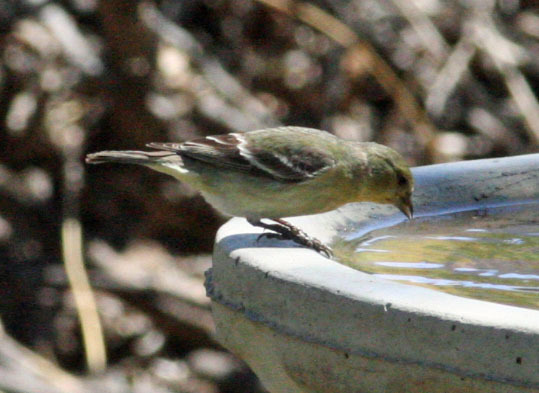 An American Goldfinch was found amongst the more common Lesser Goldfinches. Audubon’s Warblers, a type of Yellow-rumped Warbler fed on the suet. 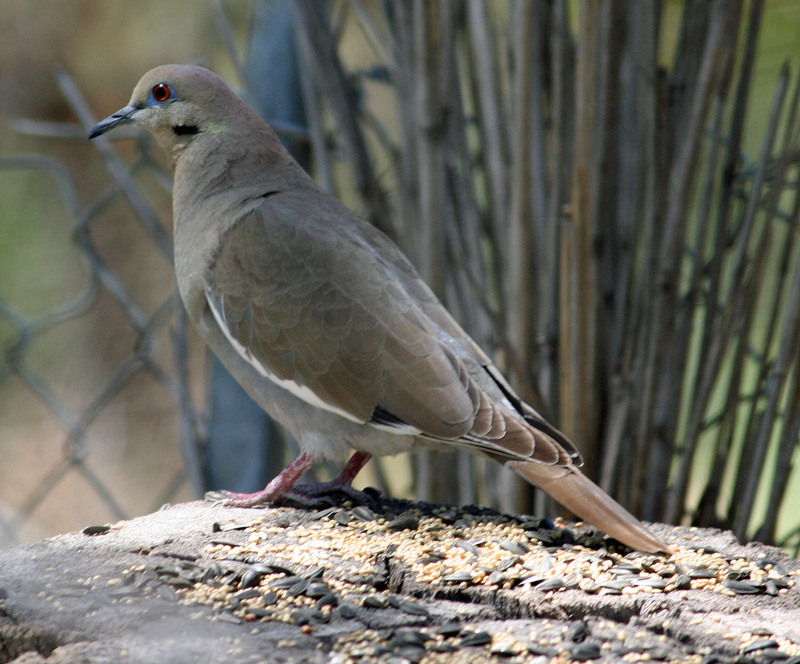 An Inca Dove joined a few White-winged Doves and a Lucy’s Warbler made a brief appearance. A sharp looking Lark Sparrow gave everyone a great look and as we were preparing to leave – a Violet-crowned Hummingbird showed up! Lunch was in town at the Wagon Wheel Saloon where we went over the trip list of the birds seen so far. For the afternoon we headed back past the Paton’s, down a dirt road to Patagonia-Sonoita Creek Preserve. Bird feeders at the center had Anna’s Hummingbirds battling it out for a spot. We had less than 2 hours before they closed for the day so we headed out on the trails. We were steps away from the visitor’s center when a Gray Hawk passed over us. In the woods we had a Bewick’s Wren. In an open field a bird similar in shape and flight of a Turkey Vulture appeared, but with a banded tail, . . . Zone-tailed Hawk! Other notable birds included a first of the year Brown-crested Flycatcher, Cassin's Kingbirds and a Canyon Towhee. Back near the visitors center a few Lark Sparrows were found. We headed back but not before stopping at the famed Patagonia Picnic Rest Stop along Highway 82. Only a Vermillion Flycatcher was seen as it was now the hottest part of the day. Back at the Best Western in Green Valley the surprise find was an Eastern Phoebe in the pool’s courtyard! We again had a great dinner at the hotel restaurant. After another free breakfast and everyone checked out we headed to Mount Lemmon. It took about an hour but we finally made it to East Catalina Highway. The highway climbs, starting out as desert and ending as pine forest. Our first stop was a pullover at Soldier Canyon. We spotted a distant Phainopepla but it quickly disappeared. We eventually saw both male and female and one perched out in the open for everyone to see. A Plumbeous Vireo made a brief appearance, flying over us and up to a cacti high above us till it continued on its way. Our next stop was Babad Do'ag Vista. Our only birds here were two Black-throated Sparrows. A bus load of school children were here on a field trip. We left so as not to disturb them. At Molino Canyon we walk camp ground area and quickly heard and saw a few Bell’s Vireo as well as a Townsend's Warbler, Yellow-rumped Warblers and some Cedar Waxwings. Moving up the mountain to Bear Canyon gave us relief from the sun with a pine covered picnic area. A Spotted Towhee was quickly found followed by a Yellow-eyed Junco. We followed this bird as it worked the campground, trying to get better looks. Little did we know that we would see more of them, some only a few feet away during lunch! We stopped on the side of the road before Windy Point when a few White-throated Swifts flew by but we could not relocate them. We heard a Rufous-winged Sparrow singing in the cliff above us but never saw him. As a reward for stopping we saw our second Zone-tailed Hawk flyover. At Windy Point we got a group photo taken when a few White-throated Swifts made a brief appearance flying quickly over us and back out. We made a side trip to Rose Canyon Camping ground. We had to pay the day use fee before making our way to the end to Rose Lake. We quickly found a Pygmy Nuthatch and another Yellow-eyed Junco. Many fishermen were fishing the lake. At the far end we found an Osprey. On the way out we heard a Red-faced Warbler but no one could get a view. It eventually flew off into the woods. We added a Ruby-crowned Kinglet and a White-breasted Nuthatch to our bird list. It was close to lunch so we continued on to Ski Valley. A pair of Stellar’s Jay were near the restaurant and Broad-tailed Hummingbirds were seen feeding at their feeders. During lunch (great chili) a couple of Yellow-eyed Juncos would land on the porch railing to feed on some left over corn bread. After a brief stop at the gift shop a Common Raven posed for pictures at a water feature coming out of a boulder next to the parking lot. On the way down we stopped above Molino and heard Canyon Wren and a calling Western Screech Owl! It was a long drive to our next hotel, the Holiday Inn Express & Suites in Willcox. We were tired so stopped at another Safeway for some sandwiches for dinner and we rested in the hotel room. It will be another long day and drive tomorrow to the middle of nowhere, Portal Arizona. After a quick complimentary breakfast at the hotel we were on the road to Portal Arizona, by way of New Mexico. We drove east on Interstate 10. Near some pecan groves I spotted what appeared to be a crow, but they are very rare in this part of the state. (On our return trip I got a good look at this much smaller corvid and it had the crow’s rounded tail!) 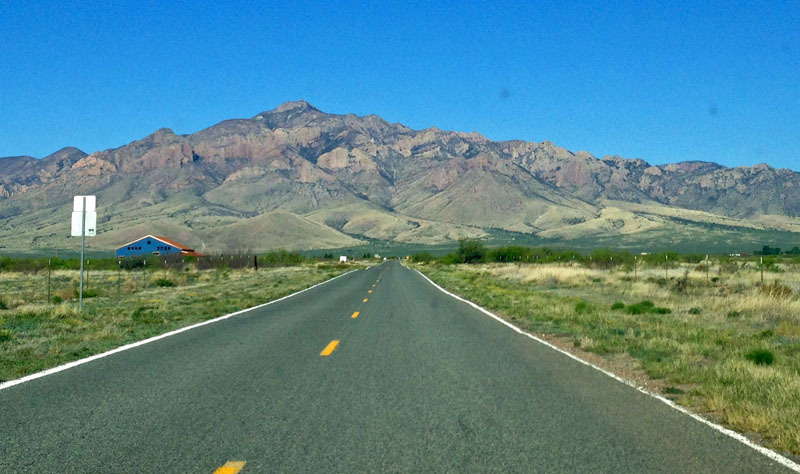 We continued into New Mexico, then exited to head south on Highway 80. 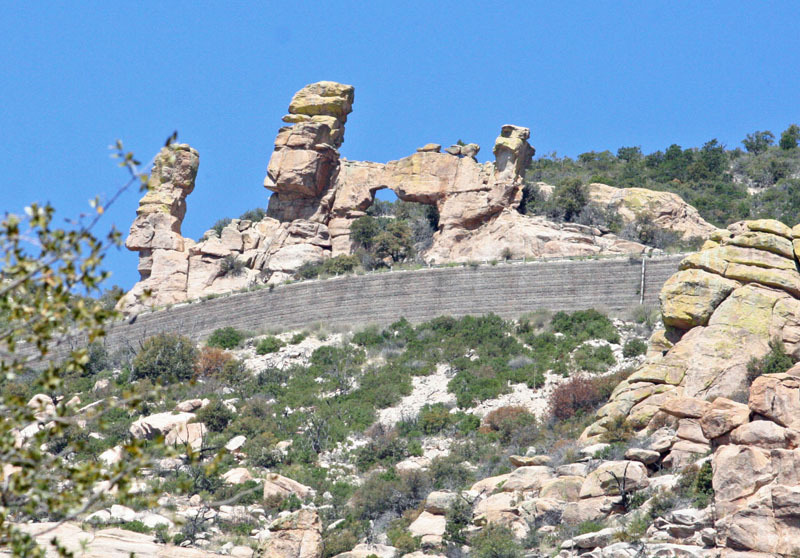 The Chiricahua Mountains loomed in the west. We stopped on the highway a couple of times, and saw Swainson’s Hawks and great looks at a couple of Black-throated Sparrows. 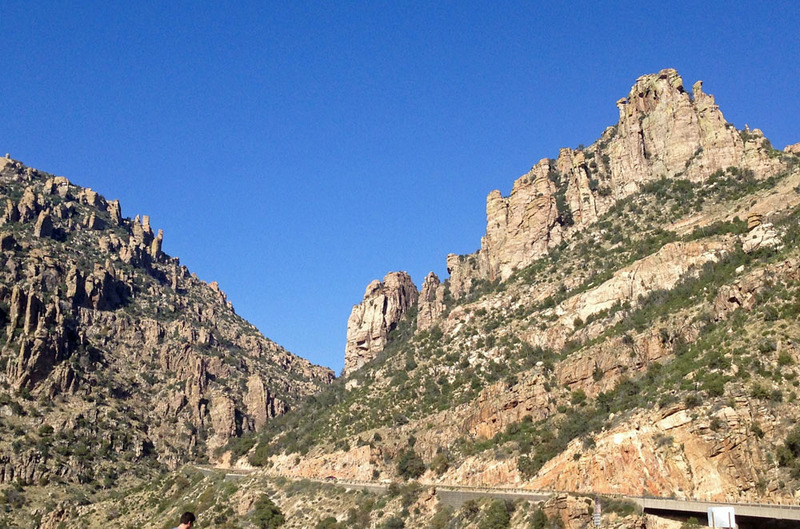 We headed west to the Chiricahuas to the little town of Portal. We parked across from the general store and birded Main Street. It was a bit quiet with few Mexican Jays and Acorn Woodpeckers flying about. One in our group found a couple of Wilson’s Warblers. We made our way into the canyon. The road for the South Fork of Cave creek was closed due to flood damage so we had to park and walk our way in. The end of this road can be great for Elegant Trogon but I knew it would be too far of a walk for our group. Fortunately this road has great birding throughout its length. We added Ash-throated Flycatcher, Summer Tanager, Ladder-backed and Hairy Woodpeckers; had another look at an Arizona Woodpecker and Cassin's Kingbird; and heard the Jose Maria call of a Greater Pewee. Then it was on to the Southwestern Research Station. Again after the obligatory shop at the gift shop we walked to their hummingbird feeders. Here we had our first looks at Blue-throated Hummingbird along with great looks at Magnificent, Black-chinned, Broad-tailed and Broad-billed Hummingbirds. A Black-throated Gray Warbler appeared nearby and on the walk back to the cars a Say’s Phoebe perched in the open field. Lunch was at the general store and we birded Main Street again. It was a little better this time with a Ladder-backed Woodpecker perched at a hole in a catus, a Curve-billed Thrasher, Eurasian Collared-Dove and a Song Sparrow. On the way out of town we took a side road, Foothills Road, to just past the Big Thicket. We parked and Kelli and I got a brief glimpse of a Javalina (Collared Peccary). An American Kestrel perched briefly on some bushes and Gambel’s Quails could be heard calling all around. We made our way on a trail to our best stop of the trip. We flushed a ton of birds making our way to this bird feeding area, again maintained by the nearby homeowners. It was quiet for a while but our patience paid off. Two dozen species made their way in for spectacular views, including the much anticipated Gambel’s Quail and Pyrrhuloxia. Birds included Green-tailed and Canyon Towhee, White-winged Dove, Gila Woodpecker, Cactus Wren, Black-throated Sparrow, White-crowned Sparrow and Cassin's Finch. Just before leaving a Western Scrub-Jay made a brief appearance. On the way out of town a Brewer’s Blackbird was found perched, then it chased a Swainson’s Hawk. Back at the hotel a pair of Scaled Quail were spotted in the parking lot! Our last dinner together was at the Big Tex Bar B Que with a stop at a Dairy Queen for dessert. Our last day was a travel day, but we had time to bird Lake Cochise and Twin Lakes Golf Course. 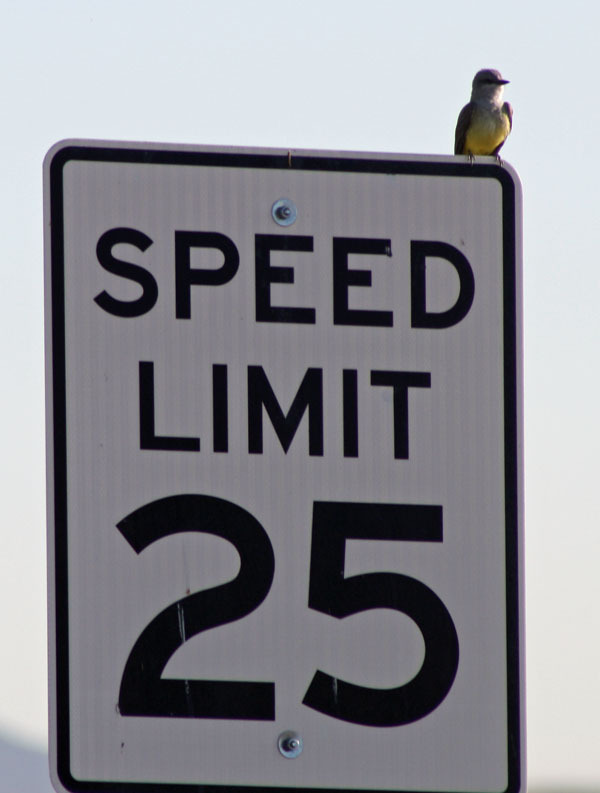 On the road in we stopped for what turned out to be a Western Kingbird. After we got out of our cars we noticed a lot of activity in the grassy lawns. A huge flock of Yellow-headed Blackbirds were feeding on the lawn. Nearby, Eastern Meadowlarks were found. These meadowlarks were the paler form lilianae, “Lilian’s Meadowlark.” It is one of 13 subspecies and is the subspecies found in the desert grasslands of the southwest U.S. from western Texas to southeastern Arizona, and through much of northern interior Mexico. Scaled and Gambel's Quail were seen scurrying around and a Loggerhead Shrike posed briefly on a STOP sign. We had another Vermilion Flycatcher and a few Brewer’s Blackbirds and Great-tailed Grackles were about. At the water treatment ponds ducks included Gadwall, American Wigeon, Mallard, Cinnamon Teal, Northern Shoveler, Ruddy Duck and one lone Lesser Scaup. The pond also had an Eared Grebe and a few White-faced Ibis and American Coot. 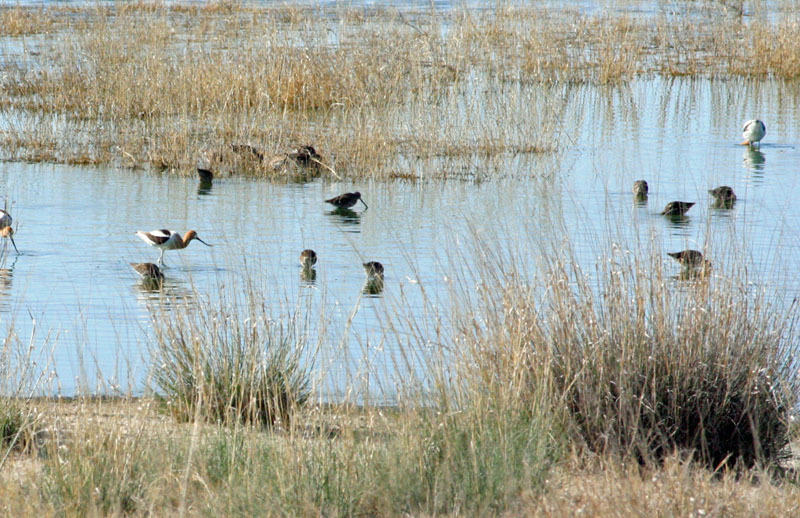 Shorebirds included American Avocet, Killdeer, Greater Yellowlegs, Least Sandpiper, Western Sandpiper, Long-billed Dowitcher and one Wilson's Phalarope in breeding plumage. We drove over to the observation deck and added a Belted Kingfisher. On the way back to the hotel Kelli and I spotted a Savannah Sparrow, the final bird of the trip. We all checked out and headed to the airport. We had a layover in Atlanta and we home just after midnight. In all we had 143 species of birds for the trip.